R.Tagg Xteriors will Remove Roof Stains Caused by Fungus, Moss and Algae, then treat your roof with and inhibitor to keep it clean for yours to come. Fungus, moss, mildew, and algae are can take years of life off of your shingles, if left unchecked. Avoid a costly roof replacement before you need it. Let R.Tagg Xteriors clean your roof and restore its original beauty. Rest assured, our roof cleaning service meets the Asphalt Roofing Manufacturers Assoc. specifications and your original manufacturer’s warranty will remain in effect. Black roof stains, often mistaken for “roof mold,” are the dead cells of hardy algae called Gloeocapsa Magma. The algae grow on the north side of the roof that gets the least amount of sun and stays damp the longest. They feed on limestone filler in the shingles and grow and darken until removed. Airborne algae spores are then carried from roof to roof and can gradually infest an entire neighborhood. These algae appear black because the organism Gloeocapsa produces a dark-pigmented covering to protect itself from the ultraviolet rays of the sun. As the algae on your roof shingles die off, the dead cells accumulate and cause the black streaks sometimes referred to as “roof mold.” These unsightly stains take months, or even years, to appear. Green roof stains are caused by Algae; these algae can cause damage and severely reduce your roof’s useful life if left unattended. Algae feed on the limestone filler used to give the shingles weight. Over time, the ceramic granules protecting the surface of the shingle begin to loosen and wash off with the rain. This reduces the roof’s ability to reflect heat rays, which can result in the roof overheating, thereby increasing air conditioning bills and shortening shingle life. 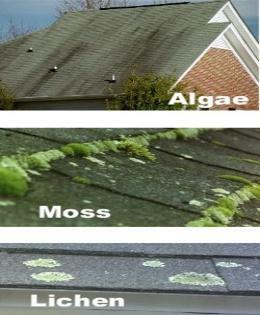 Algae presence on roof shingles also enables other damaging biological growth, such as lichens and roof moss. Roof moss and lichens anchor into the top layer of the shingles and remove granules. Moss and lichens grow up into the gullets (slots) of the shingles and along the edges, causing them to lift and make the roof more susceptible to wind damage and leaks. Acting like sponges, moss and lichens keep the roof from drying out; this perpetual dampness causes even more growth. Our roof stain removal service comes with a 3 year warranty. If you see any algae within this period of time, please contact us and we will return promptly. Still have questions? Call the Experts – R.Tagg Xteriors for a free estimate @ 216-316-3119.